In our update of 18th April, you could read about the unstable political and safety situation in Mali. In the meantime, the situation has more or less stabilized in the capital Bamako, and our representative could, after a short period of moving to Burkina Faso, retake his working place, and retake with his team our project activities in Bamako. However, the situation in the Inner Delta, and especially the part north of Mopti, remains unstable and unsafe, because of frequent infiltrations of rebel movements occupying Tombouctou. PROTOS was planning a construction campaign for providing 10 villages with boreholes in the first half of the year. The feasibility and technical studies were finished by a local engineering company. The municipalities, accompanied by PROTOS organized a public price enquiry. The works were granted to a local drilling and construction company. Unfortunately, due to the delay of the political and safety situation, the 2012 building time frame left was too short, and we had to decide to postpone the construction campaign to the next dry season, which is in the period January-june 2013. The risks were too high: safety risks for contractor personnel due to infiltrations of rebels and the risk that the heavy drilling trucks could not leave the area before raining season starts (July) and flooding season starts (August). This long overdue post comes in a time of troubles for Mali, which unfortunately seems to touch the most vulnerable groups of its population the most. The main effect of the coup d'état by the military of 22 march is political, military and economic chaos with devastating impact on general security and growing economic and food insecurity. As a result of the coup all aid not directly aimed at the population has been suspended. 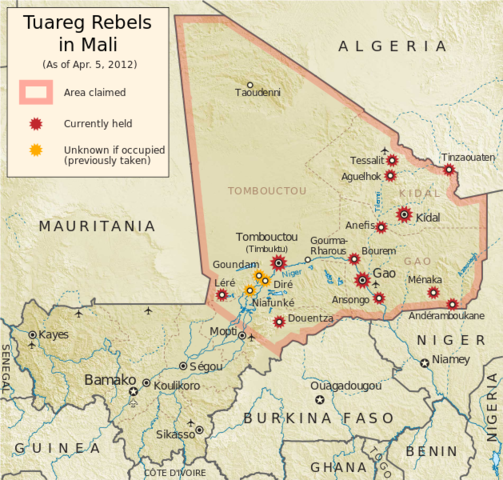 The MNLA , the AQMI , and the Ançar Dine movements took advantage from the power vacuum to further their respective causes, and now control the northern half of Mali (see map), this in many cases went accompanied by the killing of the Malian army, terrorization of the local population, and looting of government services, banks, NGO's, and private homes. With security forces absent, criminal activity, which was already a serious problem in the region, has multiplied. The insecurity has had great impact on the execution of our program in the inner Niger delta in the Mopti region. In an earlier post we had already announced that we had encountered a delay in the execution of our drinking water program as one of our French donors backed out due to AQMI security concerns and the other institutional donor, the Belgian government, was very late in transferring our subsidy for political reasons. After the abduction of 6 expatriates in Timbouctou en Hombori in November 2011 most expatriates left Mopti/Sévaré for Bamako, including our country representative. For our construction campaign 2011-2012 we were counting on providing 10 villages with a borehole equipped with hand pump and rehabilitating a non-functioning drinking water system (borehole, electric pump, water tower, 6 standpipes) for the town of Guido (2100 inhabitants). We were planning to realise the works by March/April 2012. The construction season within the delta is very short, from January (when de floodplain dries up) – May (when the first rains begin). Whilst the technical studies were finished in January/February, the engineering firm was forced to interrupt their work when armed gangs invaded the northern part of the delta where they were working (Youwarou, Tenenkou), and when the drilling company was preparing to start the works the coup took place it was decided to suspend all works because safety of personnel and equipment could not be guaranteed. Our staff based in Mopti/Sevare was given the choice of leaving or staying. All staff not originating from the region chose to leave and join their families in the south. This has also been the case for most of the government personnel and other development organizations. Our local partners continue to carry out the hygiene and sanitation programs, and so far the ATPC process in 20 villages and de school programs are going to plan. So our construction program is on standby, and we hope to restart the works as soon as possible. Unfortunately if the working environment does not improve soon, the construction period will be over and we will have to wait until next year to realize de planned water points. News from the PROTOS team in Mali. In the last update we had to report that one of our French co-funders for our programme in the Niger Delta decided to stop funding projects in Mali due to the perceived high risk of terrorist (AQMI) attacks on (expatriate) project staff, and we have been busy writing proposals (with success) to fill in the financing gap of 85,000 USD that their retreat left behind. Still on the donor front, the political impasse in Belgium (since almost one year a government of current affairs is in place not mandated to engage new budget allocations) means that PROTOS has not yet received its subsidies for 2011 and is functioning on advances and setting larger expenditures on hold. These two slight setbacks will have no influence on the achievement of the expected results of our PWX project proposal in term of outcomes, but do influence the timing of the activities, we expect a delay of three months with respect to the original planning (end of project march 2012). As a consequence, construction of the 10 drinking water infrastructures will only be possible by the end of the year as this year's construction season draws to an end; the rainy season is starting (June - August) followed by the flooding season (September - November) when high water levels, high water tables, and impassable roads make most villages in the delta inaccessible for supplies and machinery. The planning is now such that the tenders for the works will be done and all contracts will be signed before November. With an average construction time of 2-3 months for a borehole equipped with handpump, all works should be completed by march 2012 (three month delay). We took advantage of this situation by putting even more accent on the "software" component of our programme: the hygiene sensitization campaigns and the capacity building of our partner municipalities in active participatory planning and evaluation components. We started of with a hygiene sensitization programme at primary schools in the municipalities of Mopti, Fatoma, Socoura and Konna. This programme, a pilot to try a more effective and lasting way of addressing sanitation and hygiene issues in schools, is carried out by the "Jeune Chambre International" of Mopti in collaboration with the "Academie de l’Enseignement and the Centres d’animation pedagogiques", in close cooperation (supervision, training and evaluation) with PROTOS staff. Children and teachers learn to use the SARAR/PHAST methodologies in combination with Child to Child (C2C) peer education to take a lead in improving the sanitary conditions of their schools, homes and neighbourhoods. The programme encompasses two phases with the children, before and after the summer holidays. Trainers have been trained and kick-off meetings in all schools have taken place. The project will close with a documentary broadcasted on the national TV; a report describing the process and results will be available around November. Another hygiene sensitization programme is starting, a pilot for the application in Mali of a Community Led Total Sanitation approach developed in Bangladesh, which covers 20 villages, totalling about 12.000 people, in the municipalities of Kewa and Nema Badenyakafo. By the end of the year they are expected to be in the phase of wanting and building their family latrines. Councillors of other municipalities will be invited to visit and learn from the CLTS process and results. In the meantime PROTOS continues with the capacity building of the partner municipalities to plan and manage water and sanitation infrastructures using a practical handbook developed by PROTOS. The handbook (Maitrise d'ouvrage locale: Manuel Pratique) is directed at local governments and describes the project cycle from programming, to planning, executing works, and managing infrastructures and includes a toolbox (ie examples of tender documents, contracts, management conventions). We will upload this handbook and hope it will illustrate how PROTOS accompanies local governments in assuming their role in developing and managing drinkwater and sanitation infrastructure on their territory. We have just closed the first phase (2004-2010) of our program entitled "Integrated Water Resources Management in the Inner Delta of the Niger", and have started the second phase for which core funding is supplied by the Belgian government for 2011-2013 (Peer Water Exchange provides co-funding for the first year). Unfortunately the year started off with some bad news; one of our other co-donors for the second phase, a French foundation, decided to stop funding programs in Mali due to fear that the insecurity situation would not allow for monitoring and evaluation of projects. Hopefully we will find additional funds to fill in this gap and hopefully nobody gets kidnapped in the area! January was a month of planning and studies. Project staff visited all 18 municipalities in our intervention area within the Inner Delta to present our new three year program, to discuss new strategic choices, and to prepare the yearly action plan which will be presented for adoption by the program steering committee in February/March. In the second phase even more attention will be given to capacity building of municipal authorities in the programming and planning phase of water and sanitation infrastructure, in the sense that micro-project proposals need to be prepared and submitted by the municipality to the steering committee for approval (what infrastructure, where, justification, budget estimation, timeline for execution). One of the objectives of this approach is to enhance responsibilisation and ownership and at the same time help prepare municipal councils for another financing mechanism put in place by the Mali government to which municipalities can submit financing proposals for development activities, called de ANICT (Agence Nationale des Investissements des Collectivités Territoriales). Another new element that we introduced in our program is the concept of Community Led Total Sanitation, municipalities can now also propose one or more villages in which PROTOS will coordinate the whole process. So in short, preparations are underway, and amongst the many capacity building and hygiene sensitization activities we hope to finance 10 new drink water infrastructures in the villages most needy and achieve 100% access to latrines in around 15 villages this year! Will keep you posted. Maintenance: in the municipalities, local technicians were formed in maintenance techniques and repair of pumps, and the water users committees (WUCs) were set up and trained to manage the infrastructure. 1. For the hand pumps, it is agreed to pay an monthly fee of 50 FCFA by married woman : this can be paid in money or in cereals. This contribution is to cover maintenance and future repair costs. People using a hand pump are not paying a tax for the municipality. 2. For small distribution networks, the price is fixed at 50 FCFA/ bucket (15 à 20l). The tax for the municipality is 3% on this price. The price of water is not only used for maintenance and repair works, but also for the amortisation of costs of the network. During 2013 work was done to clarify and operationalize conventions and agreements between local management committees and councils of municipalities, in order to ensure the quality and continuity of the service. This are the last steps in the guidance PROTOS is giving by the local contractor ship approach. most municipalities still have a strong focus on the construction phase and the capacities/competences necessary to focus on sustainable management are still weak. In 2014, further supervision and guidance of the municipalities and WUCs will be given on the establishment of a sustainable management structure, creating a drinking water association, with adequate control and monitoring mechanisms. 6.042 people in 12 villages in the 4 municipalities Fatoma, Korombana, Koubaye and Ourobédoudé.